Photo taken by Andrew Sawyer, UGA Wilcox County Extension of false white mold. This article is from an educational update email from Dr. Bob Kemerait, UGA Plant Pathologist. Dr. Kemerait gave permission for Panhandle Ag to use this to share with the growers of Florida. Andrew Sawyer, UGA Wilcox County Extension, sent me these great pictures yesterday afternoon. They are images of what we call “false white mold” which is caused by the fungus Phanerochaete. This is NOT the white mold, aka stem rot, that causes so much damage to our peanut crop and growers SHOULD NOT spray anything for it. False white mold does NOT harm the plant; in fact the real damage false white mold can cause is that growers spend money unnecessarily fighting it. 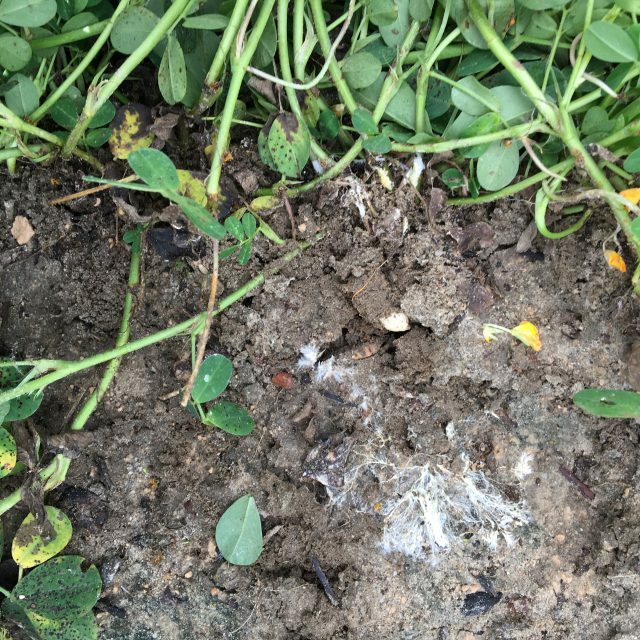 Picture of false white mold, taken by Andrew Sawyer, UGA Wilcox County Extension. 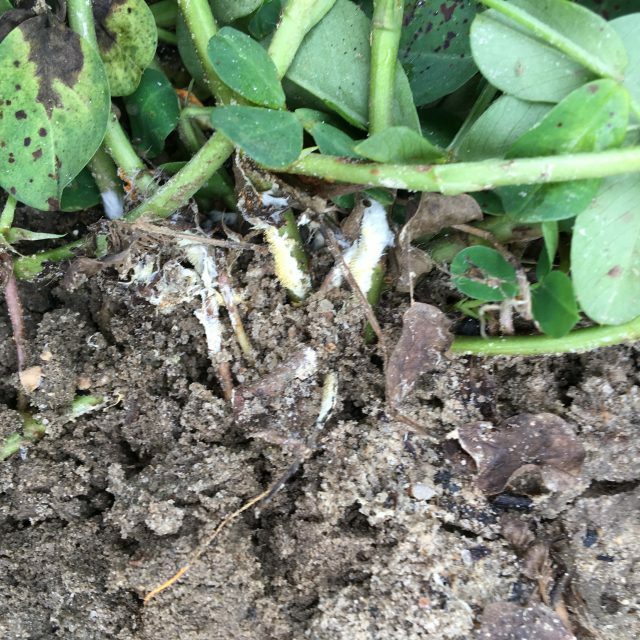 False white mold is most often found in fields planted using conservation tillage, where the white fungal growth covers both the limbs of the peanut crop and the associated crop debris. Early in its growth and development, the Phanerochaete fungus appears nearly identical to the white mold/stem rot pathogen and all-around bad guy Sclerotium rolfsii. However, as False white mold ages it begins to turn a yellow-orange color and takes on a toothed or hairy appearance. False white mold NEVER produces BB-sized sclerotia like Sclerotium rolfsii does.